We always love hearing from past, current, and prospective grant partners, so if you have any additions to this summary or are interested in providing us with more feedback, please don’t hesitate to reach out! Of the twenty-five respondents, roughly half (13) had received funding in amounts over $5,000. 10 organizations had received leadership development grants (capped at $1,500 per application) and another 5 had received grants in amounts up to $5,000. These numbers do not total 25 because some organizations may have received more than one type of grant. We used this breakdown specifically because we have different grants processes for grants up to $5000 (these do not require an LOI, and have a much shorter application form); leadership development grants; and grants in amounts over $5,000. Submitting an LOI prior to a full grant application is beneficial and lightens my grantseeking workload. The timeline between the LOI submission and invitation to submit a full proposal was appropriate (usually 4-6 weeks). Most respondents to this survey—as well as those we’ve spoken to anecdotally—seem to like having an LOI step prior to submitting a full proposal, so we plan to keep this in place as-is. While we understand our communications about priorities and funding decisions was limited in years past, we will be updating our website and email messaging to better outline 2019 priorities ahead of time this year, and are committed to providing feedback to organizations whose requests for funding are declined (at the LOI or application level) in the future. What did you think of the application form? We received a small number of mixed comments about character counts – 2 said they hate character counts of all varieties, while 2 said that really long character counts make them worry that short answers are too short and 1 said that they had to cut their responses to meet our too-short character counts. Only one person requested a budget template to upload their budget into; we may offer this in the future as an optional downloadable template, but will continue to allow grant applicants to submit budgets in whatever template works best for their purposes. I liked being able to pre-populate my answers and was then able to edit them to customize for this specific grant request. I didn't realize the GuideStar fields were editable after import. 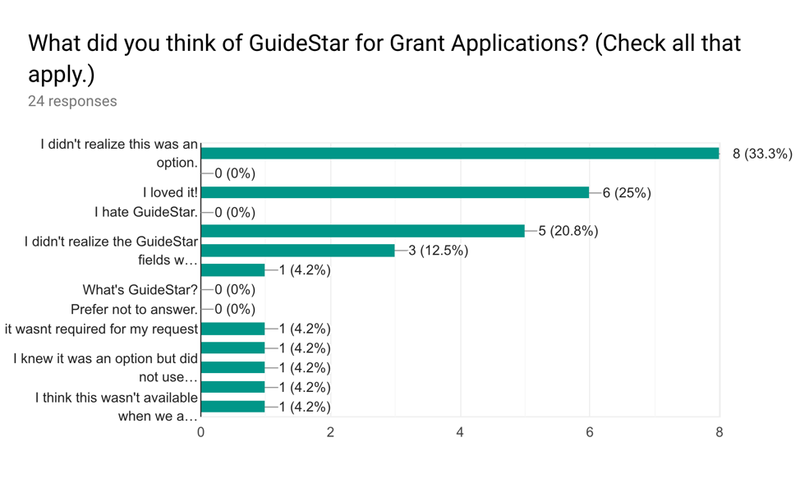 While answers here were a bit all over the place, we clearly need to do more to clarify what Guidestar for Grant Applications is, how it can be used, and why we believe it’s beneficial in the grants process. We’ll be working on a blog post explaining the tool and why we’ve implemented it, which will be shared in our Q1 2019 e-newsletter to maximize reach. Additionally, we will provide links to additional instructions around G4G fields and how they can be used within each grant application in our online portal. These instructions will specifically clarify that a) G4G fields are entirely optional and b) that imported answers can be edited after import. We had 2 recipients who were unclear when reports were due. In response to this, we will refine and clarify communications sent at the time of the grant award to more clearly outline reporting expectations from the very beginning of our funder relationship. As automated reminders were well-received, we’ll keep those in place, which will hopefully further clarify reporting deadlines as they approach. We had a few respondents who would have preferred a phone call and/or in-person meeting in lieu of written reporting. While we will still require some form of written report at the end of a grant period to ensure that we are collecting information for our own records and to share in our reports and with our board, moving forward, we will be offering the option of a phone call or in-person meeting to replace any interim reports requested between the original grant award and final report. This option will be communicated in grant award letters as well as in instructions for each report submission and in the automated reminders sent out about these interim report deadlines. In response to the feedback around more opportunities to meet with staff and/or board members of the foundation, we’ll be implementing “office hours” opportunities in 2019. Since we don’t have an actual office, these will be informal opportunities throughout the year to meet with staff and/or board members at a coffee shop during a set window of time. These will be held in Frederick, Baltimore and Annapolis. Details will be shared as soon as events are finalized — stay tuned for an announcement on this to come later this week! We’re also very excited to work on new ideas around bringing our grant partners together in 2019 in meaningful ways. In addition to the “office hours” opportunities mentioned above, we will be exploring ways to hold more formal and informal convenings of and trainings for our grant partners in 2019. Keep an eye on our blog and emails for announcements about these trainings and convenings. In addition, we will continue to offer our staff’s time to support website rebrands and content, communications, and strategic planning. If you are a current grant partner interested in this kind of support from us, please contact Kerry McHugh for more information. We’re still very much working out how and what this might look like, and appreciate the feedback regarding potential conflicts of interest. If this is something you’d be interested in discussing with us further, please contact Kerry McHugh at kmchugh@hjsfoundation.org for more information. First off, we actually do offer multi-year funding! While one-year requests may be made without an invitation, multi-year awards are currently made on invitation only, and grant partners must have received at least one year of funding from us prior to an invitation being made for a multi-year commitment. In reviewing the language on our website and grant portal on this, we realize it’s a bit unclear, and will be correcting that ASAP. For the rest – well, we’re trying to share the good, the bad, and the ugly here, so we’re pretty pleased we have so many good comments to share with the world. We love working with you all, and are honored to be able to partner with you in changing the systems around cyclical poverty. Thanks to all who shared their time and opinions in this survey. We are commited to taking each bit of this feedback to heart, and look forward to continuing to learn with you all in 2019. If you have any additional comments, or would like to follow up on the feedback outlined above, we can always be reached at info @ hjsfoundation.org .